Popped in on Wednesday lunchtime. Extremely quiet. Sat in the very nice garden and enjoyed a couple of the best pints of Sheps I've had in ages. From memory they do Masterbrew, Spitfire, London Pride and Abbot on handpump although the last two weren't on. The landlord and his wife, who've been there for two years, also keep twenty four chickens and fresh eggs can be bought at the bat for �1 for six. 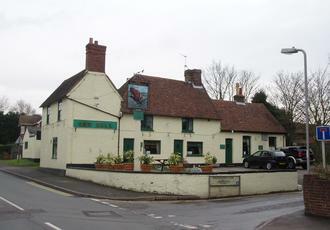 With this village pub being within walking distance from home, we must return again. Have been here several times for dinner, and the food is fresh and excellent. Also the bar area is comfy and relaxing. Just hope the fact the lease is up for sale does not mean things will change too much. Great old local pub. Superb example of a reinvigotared local which has diversified into reasonably priced, high quality home cooked food. 2 beers, Spitfire and Masterbrew, Spitfire was on the turn, so exchanged without fuss for Masterbrew. Bar area is very local with plenty of regulars and all seemed friendly enough. The food area feels like a restaurant with table service but it is no way cut off from the pub. The food was presented exceptionally well, piping hot, fresh ingredients and excellent flavours. Menu is traditional English but choice extends to Italian and French mains such as bourginon and pasta. Desserts outstanding and again superbly presented. Very well run pub, excellent for an evening out. Traditional village pub with low ceilings and lots of wood (created over time from at least different buildings - see photograph). Friendly atmosphere, and several comfy chairs. Four handpumps (with three on at time of visit), bur beer offering spoiled slightly by the Spitfire which was just starting to turn.